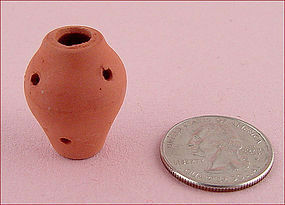 Miniature Hen and Chicks Clay Pot for Doll Houses, Etc. Several years ago, my husband and I were involved in building dollhouses and decorating them with authentic handmade to scale items. Purchased at an antique mall sometime ago, these kits were made by X-Acto/The House of Miniatures. One kit is a Chippendale sofa, the other kit is a closed cabinet top. Both kits have been opened but all parts/pieces/components are inside the boxes! 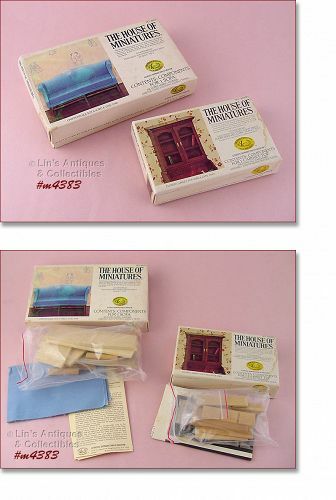 These are really neat items – they are 1:12 scale – perfect for a doll house, for a dollhouse room, a shadowbox display, etc! 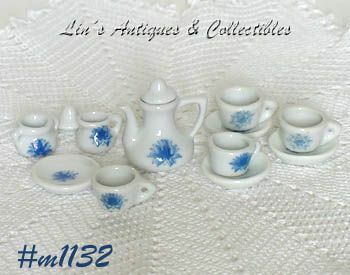 REALLY NEAT MINIATURE DINNERWARE ITEMS IN A PRETTY WHITE COLOR WITH A BLUE FLOWER DESIGN. THERE'S A 1 1/2" TALL COFFEE SERVER WITH LID, CREAMER AND COVERED SUGAR MEASURE 5/8" TALL, THERE ARE 4 CUPS THAT MEASURE 5/8" TALL, AND 4 PLATES THAT MEASURE 1 1/4" DIAMETER. CUTE!